I received the following email from the person responsible for the valentines day gift that took place in less than a week ago. I replaced the wiki link he sent with one translated by babelfish so you can read for yourself what Affichage Libre is. I wasn't aware of France's dedication to open public communication. Basically they reserve a certain amount of space in public depending on the population density. "In theory, these sites of posting in various forms (panel, pillar-shaped billboard, wall…) must be reserved for associations or any person wanting to pass a free non-profit-making or commercial advertisement. Certain communes reserve panels by type of posting by distinguishing these three categories: political posting of expression, associative posting, free expression. Unfortunately, a big number of these spaces of freedom (especially in the great agglomerations) are used by advertisers of spectacles or more or less commercial demonstrations, which removes the free character of these free means of communication." An interesting idea even if it doesn't fully work. At least they recognize the need for public communication alongside all of the commercial messages. This was translated by a good friend from the original French email. On the occasion of Valentine's Day I asked the couples amongst my circle of friends if I could take pictures of them while they were kissing. 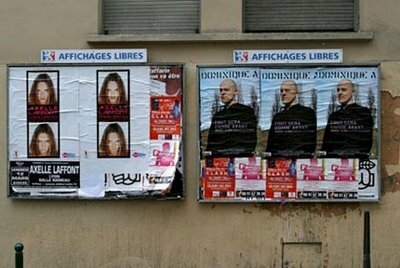 For a few months I've been using the "free posting boards" as a means of free expression (wikipedia); these panels are unique to France, they exist in all our cities in formats of various sizes and accessibility which varies according to local policy. I have the good fortune to live and work in Mulhouse, my city possesses a number of large "affichage libre", I try to put them to good use, and I invite you to do the same (as you will see…). You can see all of my collages on my website. I dedicate this series of collages to all lovers, couples or otherwise, because the important thing is to love. Thank you to all couples that agreed to participate in my little game. A hearty hello from Alsace!